Alex Childress came across a large plant Tuesday while working a summer landscaping job, and it briefly brushed his face and arm as he cut it down. It turned out to be a giant hogweed whose sap can cause burns, blisters and blindness. 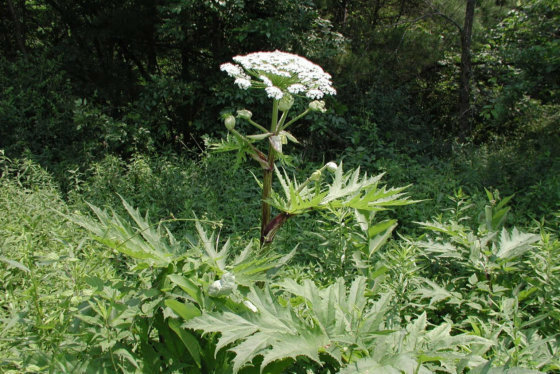 FREDERICKSBURG, Va. (AP) — A run-in with an invasive plant has landed a Virginia teen in a hospital with second- and third-degree burns. The Richmond Times-Dispatch reports 17-year-old Alex Childress came across a large plant Tuesday while working a summer landscaping job, and it briefly brushed his face and arm as he cut it down. It turned out to be a giant hogweed whose sap can cause burns, blisters and blindness. Childress was taken to a hospital later that night and transferred to a burn unit. The plants have been spotted across Virginia this summer. The state Department of Conservation and Recreation says they can grow up to 15 feet tall. Childress was discharged Thursday. His father, Justin Childress, says his son appears to have a long recovery ahead of him.